The tonsils are groups of lympho-epithelial tissues that surround the upper aero-digestive tract and they form the Waldeyer's ring. Enlargement and infection of these may lead to otitis media, obstructive sleep disordered breathing, and alterations of facial growth. Furthermore, they are associated with behavioral disorders, poor school performance, and craniofacial abnormalities. Of note, however, are cardiopulmonary complications such as pulmonary hypertension, cor pulmonale, and congestive heart failure in children. Previous studies have reported pulmonary hypertension in obstructive adenotonsillar disease. For instance, Yilmaz et al. reported a prevalence of 51.9% pulmonary hypertension in Turkey and Granzotto et al. reported 13% in Brazil. In fact, different investigators have emphasized that asymptomatic cardiopulmonary changes suggestive of pulmonary hypertension were evident on ECHO. Hence, justifying echocardiography as a routine investigation in these children. Accordingly, several researchers have attested to the efficacy of adenoidectomy with or without tonsillectomy either to prevent pulmonary hypertension or to correct such pulmonary alteration on those patients who were already affected and with proven normalization of echocardiographic signs. This study aims to highlight the cardiopulmonary sequelae in a child with obstructive adenoid enlargement and temporomandibular joint (TMJ) ankylosis in our practice. C.M. is a 9-year-old girl with bilateral TMJ ankylosis and severe trismus. She first presented to the pediatrician at 6 years with noisy breathing, blocked nose, and loud snoring. She had repeated episodes of bilateral ear discharges in her infancy. At 2 years the parent noticed a progressive disfiguring of her jaws and was diagnosed with TMJ ankylosis secondary to chronic ear infection by MFU team. At 7 years, she had apneic attacks, easy fatigability, and leg swellings. The pediatric cardiologist reviewed her; pulse rate was 96/min, blood pressure was 100/60 mmHg (right arm). The jugular venous pressure was elevated, with displaced apex beat at the sixth left intercostal space, anterior axillary line, with parasternal heave. There were normal first and abnormal second heart sounds with a characteristic loud P2. Chest X-ray showed cardiomegaly; electrocardiogram (ECG) revealed right ventricular hypertrophy and right atrial enlargement; echocardiogram revealed both right atrial and right ventricular dilatation, both septae were bulging toward the left side, there was moderate tricuspid regurgitation with Vmax of 3 m/s; there was also moderate pulmonary valvular regurgitation. The end-diastolic volume was 54 ml, ejection fraction of 39%, and shorting fraction of 18%. She was diagnosed with cor pulmonale and heart failure secondary to severe obstructive adenotonsillar disease. Her condition did not improve significantly on treatment, hence a referral to ENT team. 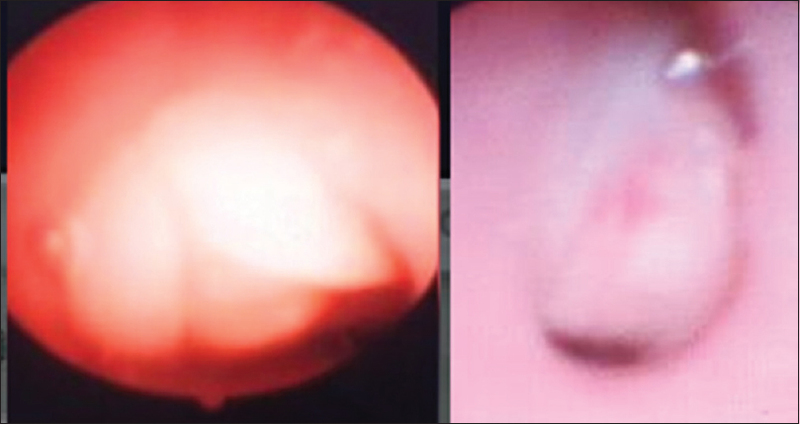 At ENT clinic, flexible nasopharyngoscopy revealed bilateral adenoidal obstruction of the choanae. She was referred back to the pediatricians to continue management and was scheduled for adenoidectomy at a future date because we did not have powered instrument for a transnasal approach. 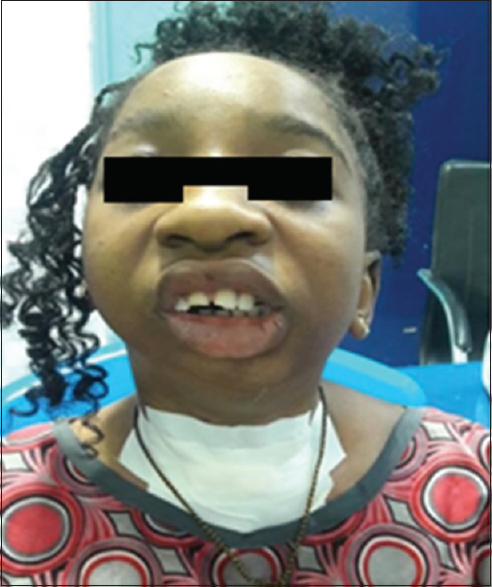 Unfortunately, she was rushed back to the ENT clinic 8 weeks later with severe upper airway obstruction necessitating an emergency tracheostomy [Figure 1] and [Figure 2]. At 8 years of age, the first attempt at endoscopic transnasal microdebrider-assisted adenoidectomy was aborted because the patient had a witnessed cardiac arrest during induction of anesthesia. She was promptly resuscitated and referred back to the pediatric cardiology team. Nine months later, she had an endoscopic transnasal microdebrider-assisted adenoidectomy and was successfully decannulated of her tracheostomy tube [Figure 3]. A repeat echocardiogram 4 months later showed improved ejection fraction of 59%, shorting fraction of 31%, and left ventricular end-diastolic of 24.5 ml; all other findings were normal. 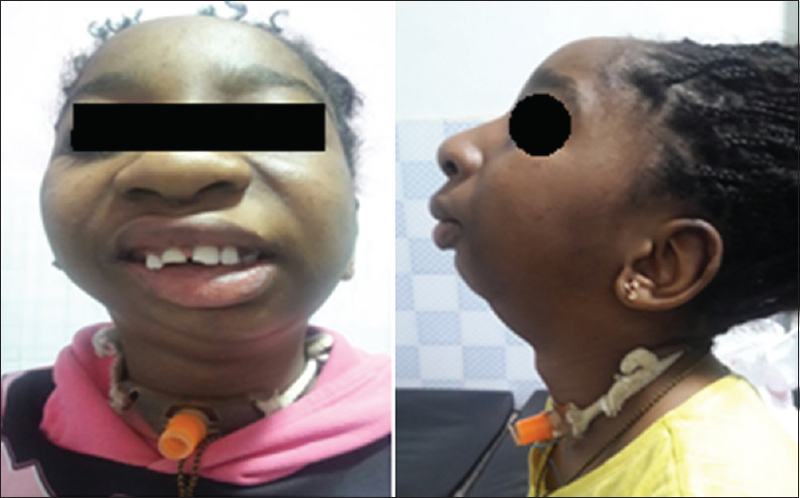 This case had deformity of the jaws and severe trismus associated with adenoidal hypertrophy, which is the main cause of upper airway obstruction in children. This in addition with micrognathia and its attendant complication of glossoptosis may result in hypoxia and pulmonary hypertension due to pulmonary arterial vasoconstriction and vascular remodeling. In pulmonary hypertension, the right ventricle pumps against high pressure load resulting in right ventricular hypertrophy, right atrial enlargement, elevated jugular venous pressure as was witnessed in the index case. This clinical scenario was similar to cases reported by Luke et al. though our case did not have pulmonary edema but an elevated left ventricular end-diastolic volume was also observed; this may be related to the concept of limited ventricular reserve in children, bulging of the interventricular septum toward the left ventricle may alter the geometry of the left ventricle resulting in depressed function. Therefore, biventricular failure may occur irrespective of the primary ventricle that decompensates. However, the improvement following adenoidectomy shows the significance of the upper airway obstruction as the precipitant. The cause of cardiac arrest in the first attempt in the index case is not completely understood. However, fatalities have been associated with this syndrome during surgery; among preferred reasons include use of opiate premedication. This has been associated with worsening hypoventilation, carbon dioxide retention, worsening pulmonary hypertension, and heart failure. Furthermore, relief of obstruction may eliminate the hypoxic drive for ventilation resulting in respiratory arrest. She later had an endoscopic transnasal microdebrider-assisted adenoidectomy with a successful tracheostomy tube extubation. In line with our approach, Abd El-Moneim et al. demonstrated that when adenotonsillar hypertrophy was the cause of pulmonary hypertension, adenotonsillectomy led to improvement in the clinical state and reversed ECG changes. The advantages we found with endoscopic transnasal microdebrider-assisted adenoidectomy included: an excellent visualization of the surgical field, completeness of adenoid tissue removal, and minimal bleeding. These observations corroborate the findings of other researchers that found this technique to be effective and convenient. However, it has the obvious disadvantage of high cost of equipment, and as a consequence, higher surgical fee for the patients especially in our low-resource environment. In conclusion, pulmonary hypertension and cor pulmonale, even though rare, are possible complications of adenotonsillar hypertrophy in children. Also, endoscopic power-assisted adenoidectomy using a microdebrider via a transnasal approach is a suitable option if the transoral route is difficult. We wish to thank Mallam Umar of ENT department for typing the manuscript of this work. Also, to the entire staff of ENT department for their cooperation during the course of this work. Wiatrak BJ, Woolley AL. Pharyngitis and adenotonsillar disease. In: Cummings CW, editor. Otolaryngology Head and Neck Surgery, 3rd ed, vol 5. St Louis, MO: Mosby-Year Book; 1998. p. 88-215. Abdel-Aziz M. Asymptomatic cardiopulmonary changes caused by adenoid hypertrophy. J Craniofac Surg 2011;22:1401-3. Yilmaz M, Onrat E, Altuntas A, Kaya D, Kahveci O, Ozel O, et al. The effects of tonsillectomy and adenoidectomy on pulmonary arterial pressure in children. Am J Otolaryngol 2005;26:18-21. Granzotto E, Aquino F, Flores J, Lubianca N. Tonsil size as a predictor of cardiac complications in children with sleep-disordered breathing. Laryngoscope 2010;120:1246-51. Abd El-Moneim E, Badawy B, Atya M. The effect of adenoidectomy on right ventricular performance in children. Int J Pediatr Otorhinolaryngol 2009;73:158-8. Jacobs IN, Teague WG, Bland JW Jr. Pulmonary vascular complications of chronic airway obstruction in children. Arch Otolaryngol Head Neck Surg 1997;123:700-4. Luke MJ, Mehrizi A, Folger GM Jr., Rowe RD. Chronic nasopharyngeal obstruction as a cause of cardiomegaly, cor pulmonale, and pulmonary edema. Pediatrics 1966;37:762-8. Macartney FJ, Panday J, Scott O. Cor pulmonale as a result of chronic nasopharyngeal obstruction due to hypertrophied tonsils and adenoids. Arch Dis Child 1969;44:585-92. Sofer S, Weinhouse E, Tal A, Wanderman KL, Margulis G, Leiberman A, et al. Cor pulmonale due to adenoidal or tonsillar hypertrophy or both in children: Noninvasive diagnosis and follow-up. Chest 1988;93:119-22. Pathan F, Sudarshan K, Satpathy S. Endoscopic adenoidectomy using a microdebrider: A series of 20 cases. Int J Curr Med Appl Sci 2016;11:116-8. Available from: http://www.ijcmaas.com/Indexing.html. [Last accessed on 2018 Apr 20].